Burlington, Ont. – April 3, 2018— The City of Burlington is providing residents with steps they can take to help reduce the risk of potential coyote conflicts during the animal’s denning season. Denning season refers to the time of year coyotes’ pups are born. Shortly before a coyote gives birth, between April and May, the coyote will begin excavating a den which they will use to raise their pups. Install motion sensor lights around your property. Coyote sightings in Burlington are common. The city’s green spaces and forested areas provide an excellent habitat for coyotes who can travel great distances along ravines, hydro corridors, and highways. Food sources like mice, rats, and garbage are readily available in urban areas, attracting coyotes to residential neighbourhoods. 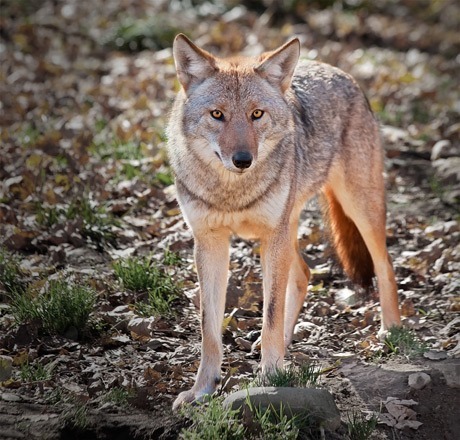 In 2015, Burlington City Council approved a Coyote Response Strategy that provides guidelines on preventing and managing conflicts with coyotes. In neighbourhoods where coyote conflicts have been reported, the city has taken actions which include things like, increasing patrols by Animal Services staff, installing additional signage to warn of coyotes in the area, and conducting door-to-door outreach with local residents and businesses about the elimination of potential food sources. I hear there is a pregnant one around Second Street and Guelph Line.